An online shopping store is a one-stop solution for all people needs. Want fashion accessories, need a furniture, footwear, books, electronics? all will be available there. But all it requires to satisfy the users is, it should have got an easy navigation, feature-rich, and most importantly very secure. As the online world is vulnerable to many threats. Then, with every possible way, shopping websites was enhanced but lacked interaction. So there came the addition of social features not only to help in logins but also in many different ways. So down here let’s see the very essential attributes of a social E-commerce script. Studies are revealing that one in three purchase is completed on mobile. So it is very essential to make your website optimized for the best look on mobiles. Or the other way is better to build a mobile app. 3 out of 4 users on an online shopping website say the important aspect of a website is its design. Design of the website is important in holding the users or let them go. So the thing is, be clear and good in design that should provide users and redirect exactly where and what they want. On early days a photo with just a description was enough for sale. But now to gain the trust of buyers sellers are exploring all possible ways to showcase their products in the best way. So provide multiple high-resolution photos and if possible even videos. If you couldn’t do both allot a good space for writing the specs and all about it. Having multiple categories and placing the right products under the right categories aren’t just enough. You must also have individual sections for deals of the day, best offers, brand-wise offer. This will intrigue the buyers. Having a wishlist might work in favor for both users and you. But make full use of user search history and products in his wishlist. And suggest products as you may like. This might create the curiosity to buy and can increase your revenue. As said above, social features on an e-commerce app have got multiple pros. Like, sellers having a social profile linked to their every post let the buyers view their brand profile and everything about them. So this builds the trust and advocacy towards their brands. And finally, but the important one is the security. A user will have entered some valuable and confidential credentials for transactions. So ensuring the security is must and foremost above all. So look out for HTTPS rather than HTTP, add two-factor authentication, etc all possible ways. So you have to consider all these above-mentioned factors before building your e-commerce website. And still are there are a lot more to consider. 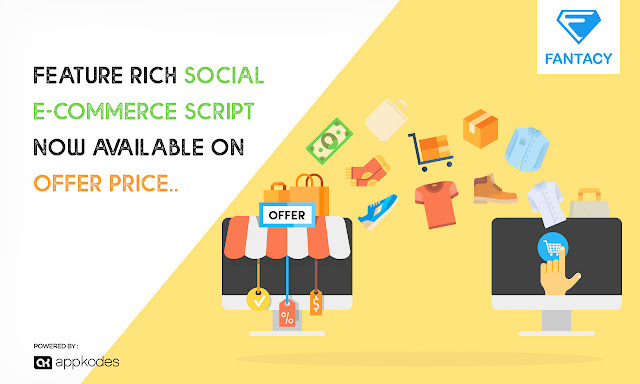 So you need to hassle about anything all you need to do is buy a readymade social e-commerce script - Fantacy and we will get you covered on all your ideas as per your wish. And the other good thing is this scripts’ ultimate package is available on 50% off from 1st to 31st of December. Act quickly to pounce on this crispy Christmas sale. Use This XMAS50 Coupon To Get 50% Offer. What Are The Strategies To Be Followed For A Multi-Vendor Ecommerce Store ? Are you an e-commerce entrepreneur trying to attempt the course of achievement in the online world? There's uplifting news for you. You can transform your online store into a flourishing commercial center by including Multi-vendor functionality! Appkodes, the leading web and mobile e-commerce business platform, offers multi-vendor functionality to empower niche online commercial centers. Through this multi-vendor highlight, the online retailer who makes his e-store from Appkodes can likewise tie-up with different merchants who wish to sell products and services on his storefront. Such an organization conveys momentous opportunities and benefits all the sellers since the shoppers like to buy different products and services from only a solitary web store. Basically, a multi-vendor feature empowers the essential retailer to make an online commercial center where different merchants can offer and deal with their own particular items through one basic web store. Multi-vendor script enables the participation of different individual vendors in a common platform to sell their products. You can provide that platform for setting up your own multi-vendor E-commerce site and can generate good revenue from there. First, you have to be clear in what all ways you can bring users to your site. Revenue can be generated only by sellers selling their products through your sites and buyers showing interest to buy it through your site. So first you have to concentrate on features that your users would look upon your site. Retaining users in your website mainly depend upon what kinds of features are there on your website to help their purpose. So by having a quality and purposeful features you can hold your users on your site. And upon earning a reliability among users you can generate more revenues from your business. A satisfied user could generate you more revenue. So fill your website with features to satisfy your users. Fancy is a clone of Fantacy from appkodes, it's a online marketplace script, Where products can be sold, bought, liked, commented, tag and share. This fancy clone script is very much user friendly script and good looking script. Now a days peoples are looking for a secured and user friendly concepts. Online marketplace script will definitely good and stand up to the eagerness of many passionate online entrepreneurs. This clone will get acceptance into many type of industries. Fancy clone script,lets the user to sell affiliate products. Which is also one among the revenue way for admin to earn from the online shopping cart website.